It’s always been difficult to find your way around Dubai and I don’t know of anyone who has embarked on a journey in Dubai which should have taken 20 minutes and ended up an hour and a half later lost in the Dubai maze! On company websites there is nearly always a location plan, your friends need to draw maps or describe that they’re in the 3rd building from the 4th set of traffic lights etc etc etc. 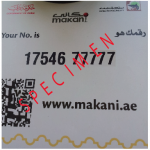 It is not unusual for anyone to get lost in Dubai but now MAKANI (Arabic for ‘my location’) has arrived! For those buildings which are on the system a sticky white notice is issued showing the geo-address linking your building to the Dubai city grid. This is a superb new official geo-addressing system which is accurate to within one square metre. Now that’s something. No longer the tears of frustration when trying to find the company location and lose the chance of a job opportunity because you are lost (or late) and that’s only one way that the lack of a systemised addressing system affects us. Some addresses in Dubai have already been issued with the 10 digit reference number. This reference number gives the exact location, within 1 square metre, of the building. Eventually all buildings will be registered with a Makani 10 digit reference number and these digits can be converted to and used in GPS systems and digital maps, including Google maps. Amazing! This means you will be able to find your way through Dubai easily as well as locate government offices, companies and buildings. The emergency services will also use this system to track your location easily and efficiently. At the moment Dubai, Hatta and the Dubai Free Zones main buildings are in the system. Some areas have been referenced, e.g. Jumeirah Village Triangle. In those areas you will receive a leaflet explaining the system and a note of your 10 digit reference number. Use it to get around Dubai or to have parcels delivered – these are just a few useful ways Makani will benefit you. You can provide that reference number to anyone and they can look up your exact location on the Makani website. Easy. Or download their app ‘Makani Dubai’ and it’ll help you find your way about. This means we should, visitors and residents alike, enjoy a relatively easy journey once the whole city is mapped out in Makani terms. The Dubai Government is making life easier and it’s all thanks to the endorsement of this system by His Highness Sheikh Mohammed bin Rashid Al Maktoum, Ruler of Dubai.